The RBI increased rates today. For the first time since Jan 2014 we have seen rates go up. The repo rate (at which banks borrow) has gone up to 6.25%. The reverse repo rate is now up to 6%. If you thought this was a crazy thing, the answer really is: no. 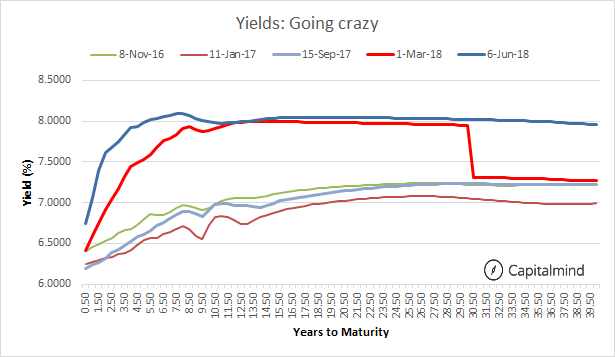 Because the rate hike was almost a done deal – in the debt markets, rates have already risen at the longer end of the curve – even for a year, a government bank like SIDBI was paying more than 8%! But the important thing is: banks are FLUSH with liquidity even now. The banking system is parking over 130,000 cr. 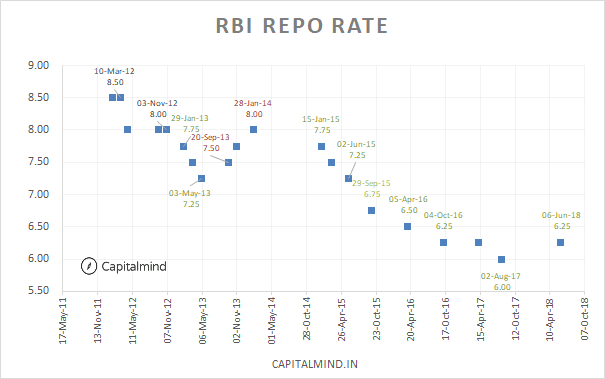 overnight with the RBI in reverse repo. And for repo, they were borrowing 50,000 cr. – so a net of Rs. 80,000 cr. is being parked as excess cash with the RBI. Effectively, banks will make 0.25% extra on this money, which is good for them. Which tells you that both the longer end of the curve, and the shorter end of the curve have risen up considerably. Which means bond prices here have fallen, and most bond funds would have performed miserably in this last year, with yields having gone up 1%. There is no negative impact. As we said, the system is parking excess cash with the RBI so it benefits because the reverse repo rate increases. For corporates and other borrowers, rates are going up already. The bond markets have hiked rates. Banks are also raising rates through the MCLR system. However there is one impact on yields: A change in policy on the Liquidity Coverage Ratio. Banks need to maintain an LCR of 100% (meaning, they have to have stuff that’s LIQUID enough to cover all of their potential payments including redemptions for the next 30 days). Take 11% from the SLR since you’ve got that in govt bonds anyhow. Now, banks can do with buying only what’s more than 13% – in this example, they now only need to buy 2% more of government bonds for the LCR. Means their borrowing comes down at least in the short term. The RBI policy hasn’t thrown any major surprises. But at this point the important thing is: for the market, interest rates have risen. Let’s leave it at that.